I almost titled this post “Baseball & Bad Decisions” but I didn’t want you to think you were reading Charlie Sheen’s autobiography. For those of you that don’t get the Charlie Sheen-baseball tie, hang out with my husband for a bit. You’ll watch Major League so many times you’ll forget all about winning, tiger’s blood & the goddesses. 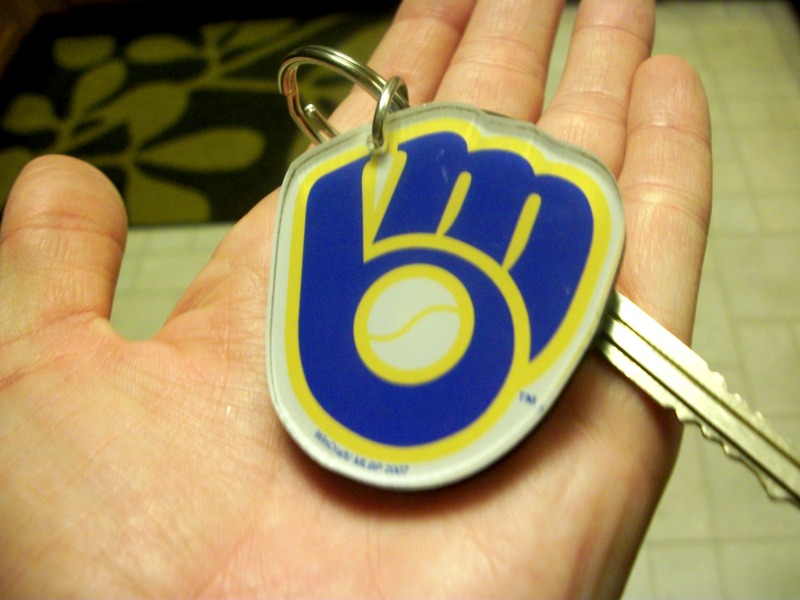 The baseball I speak of is the Brewers game we attended yesterday. 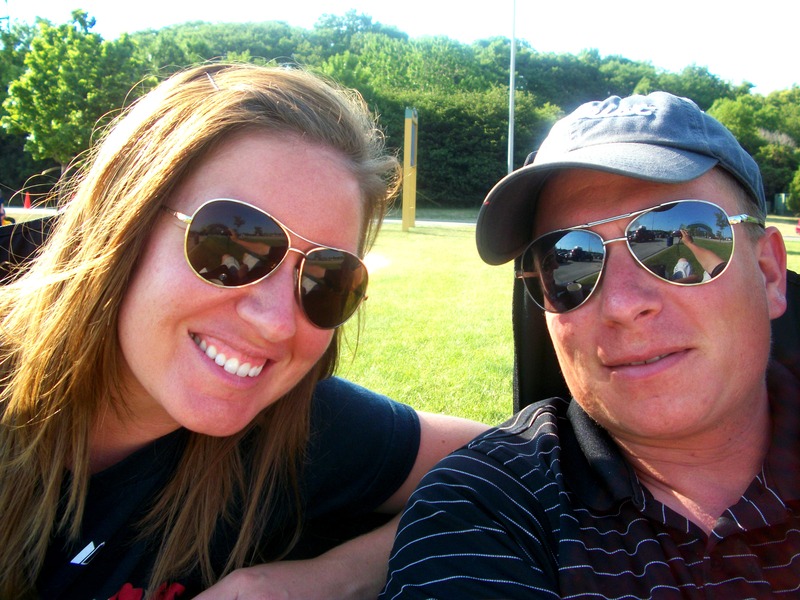 It was approximately 400 degrees outside so we didn’t do the whole tailgaiting business but the hubby & I did enjoy a cold beverage on the grass near our parking spot before heading into Miller Park. “What’s with the look?” I ask. “I’m just so happy we’re here. I love this place.” he responds. Every time. And let me tell you, there are days when I’m not as into the game as others. There are days when I hate the 1.5 hour drive to the park. There are days when even the cutest of outfielders can’t keep me focused on a boring game. But when I see that smile on that man’s face, it’s totally worth it. 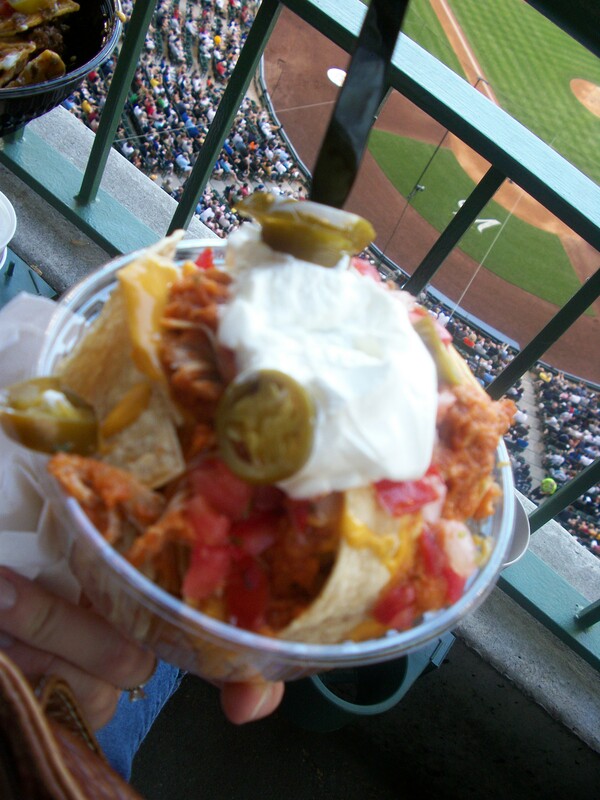 Bad decision # 1: Delicious chicken nachos. 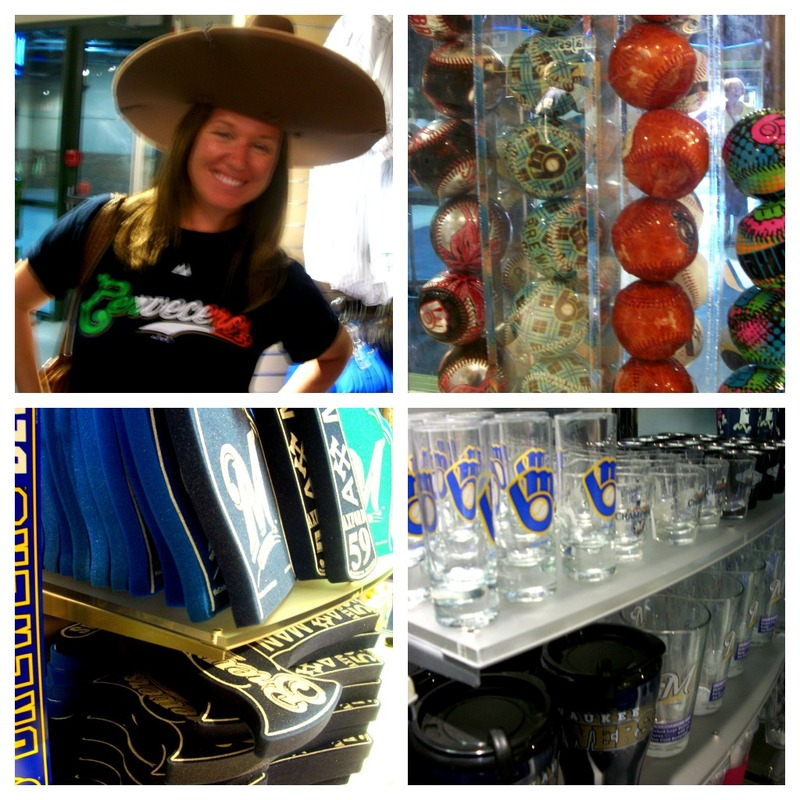 We had some fun in the Brewers Team Store. Notice my Cerveceros shirt? Cerveceros is Spanish for Brewers. Back in 2006, we unexpectedly attended the inaugural Cerveceros Day Game, which celebrates Hispanics in baseball. I’ve always been in love with Hispanic culture & the Spanish language so I was immediately in love with this idea. We attend Cerveceros day each year & I wear my Cerveceros shirt even when it’s not Cerveceros day, which was the case yesterday. Yesterday was Italian day. Italian is one of the sausages. This is probably getting kind of confusing if you’re not from around these parts. 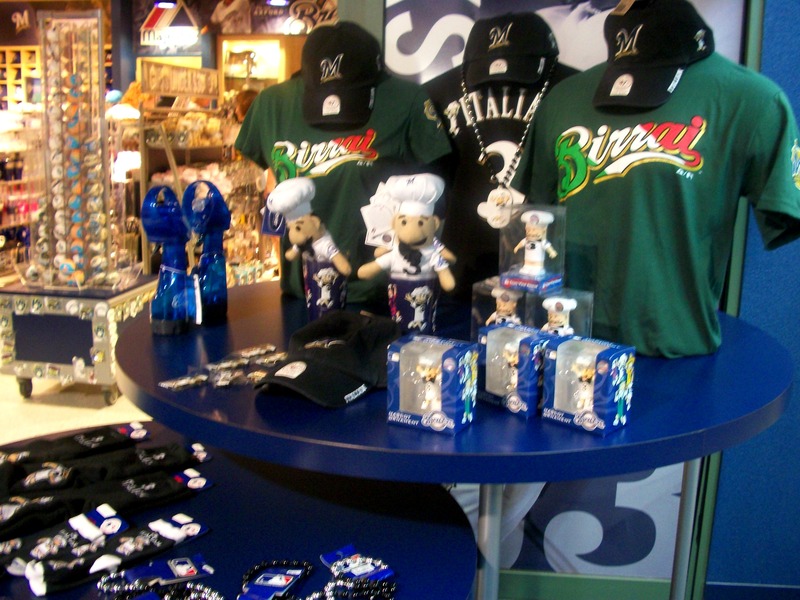 Miller Park is the home of the Famous Racing Sausages. #2- Polish, #1- Bratwurst, #5/Cinco- Chorizo (my favorite for obvious reasons), #3- Italian & #4- Hot Dog. 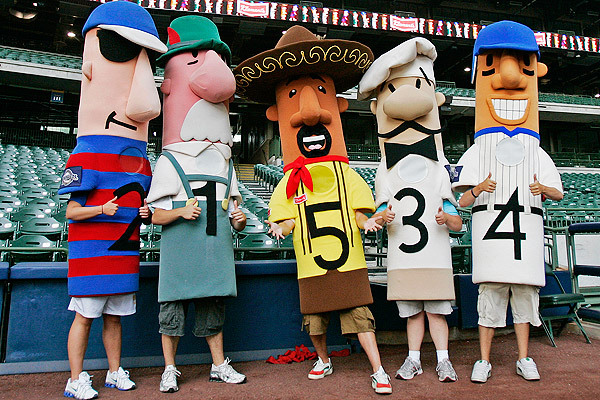 The sausages race at each game during the 6th inning. You can text your vote for the winner. I vote for Cinco every time (duh) & may or may not have a collection of Cinco paraphernalia. Go Chooooriiiiizzzoooo!!! This weekend was an Italian celebration so all of the Italian gear was on display. The game was a Brewers blowout so we left early and headed on over to Summerfest. Not before a quick photo with a giant recycling bin though! 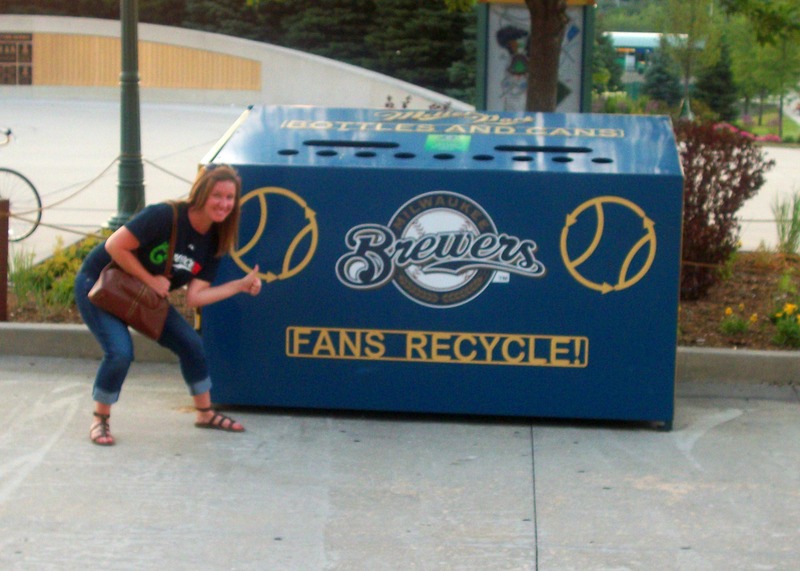 Unfortunately, though some Brewers fans (myself included) may be big on recycling, Miller Park isn’t exactly so. They use sooo much plastic for beverages & recycling in the park is hard to come by. I collect all of the plastic around me & shove it in my purse. I bring the more durable cups home with me & recycle the rest in these bins outside. Recycling (or lack thereof) aside, Miller Park is a seriously awesome place. If you find yourself in Wisconsin during baseball season, it’s totally worth it to hit up a game. You won’t be disappointed. 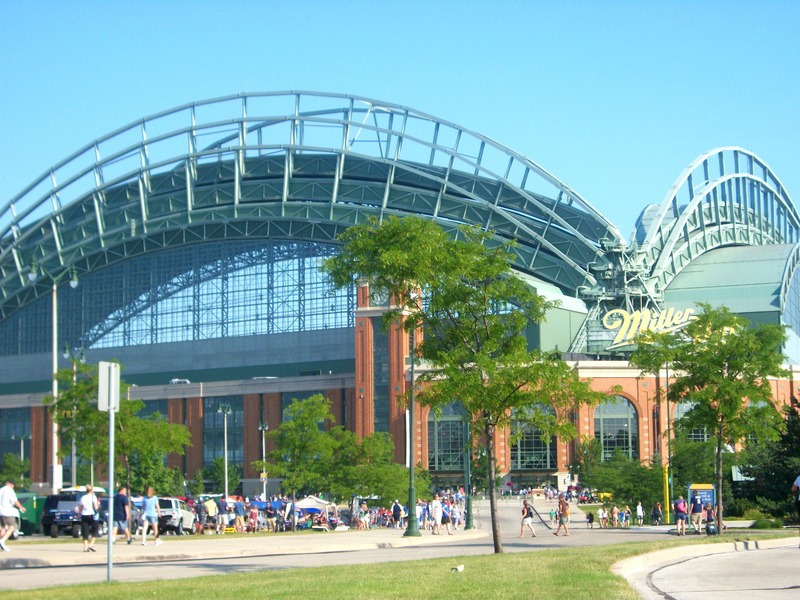 Though Milwaukee isn’t all that far from us, we seldom make it past Miller Park or the airport. It was nice to get out & catch some other views of the city. 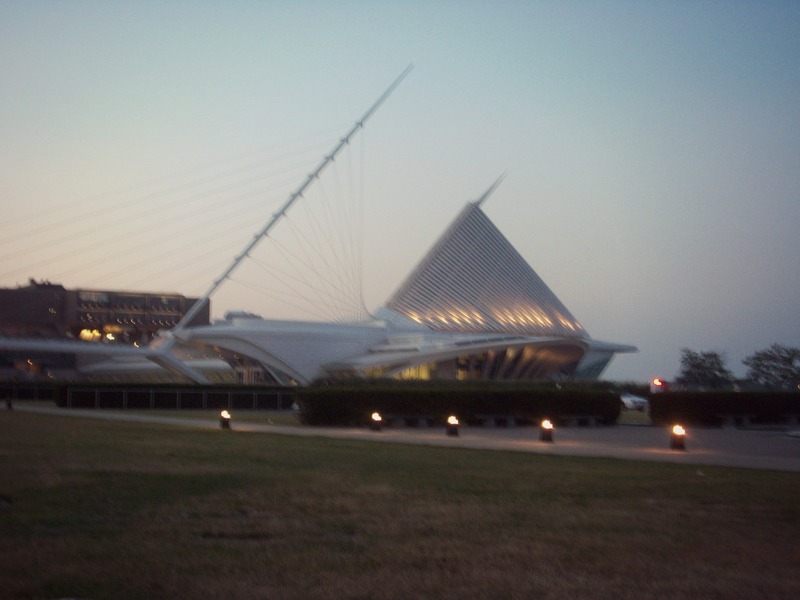 The Milwaukee Art Museum is a sight for sore eyes. Especially in the beautiful dusk of the evening. 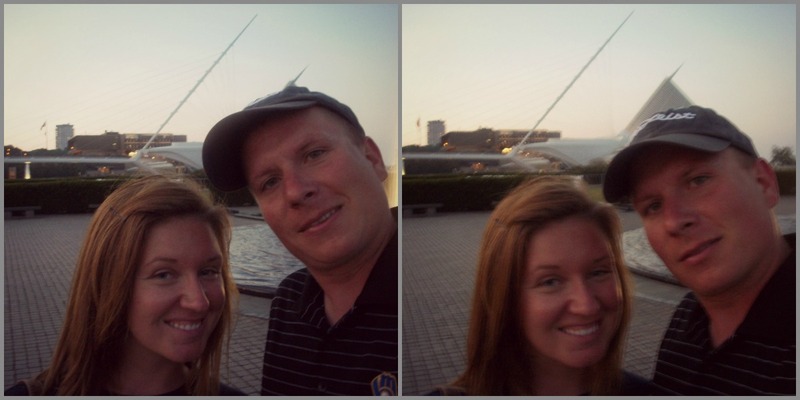 My slightly intoxicated husband thought we should try for a self-photo in front of it. Try is obviously the key word. We arrived at Summerfest & got in line for tickets. I totally spotted The Healthy Everythingtarian while we were waiting in line. At least I think so. I always think I’m spotting bloggers. 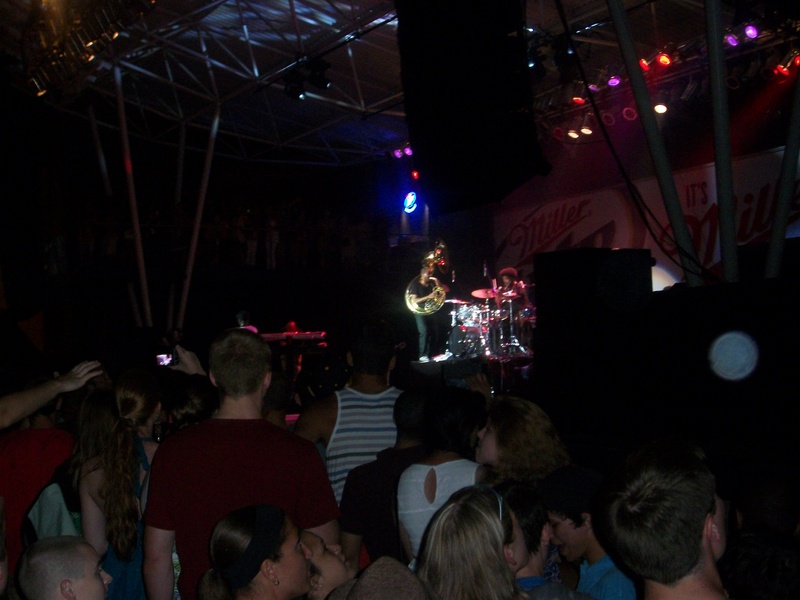 Summerfest is billed as the World’s Largest Music Festival & attracts over 1 million people each year. More than 700 bands perform over the course of the 11 day festival. Last night, we had just one band we wanted to see. The Roots! If you’ve ever watched an episode of Late Night with Jimmy Fallon you’ve seen these guys. But I have a secret. I first discovered them in the movie Chasing Liberty. You know, the one where Mandy Moore plays the President’s daughter & rebels by attending the Berlin Love Parade? Well, there’s a scene where she’s at the parade & The Roots are playing. I became obsessed with the song The Seed 2.0 after seeing that movie. Hubby was a fan long before me & this was our second time seeing The Roots live together. They are a legit band & have a hip-hop/soul vibe that I just love. Perhaps my favorite part about The Roots is Tuba Gooding Jr. 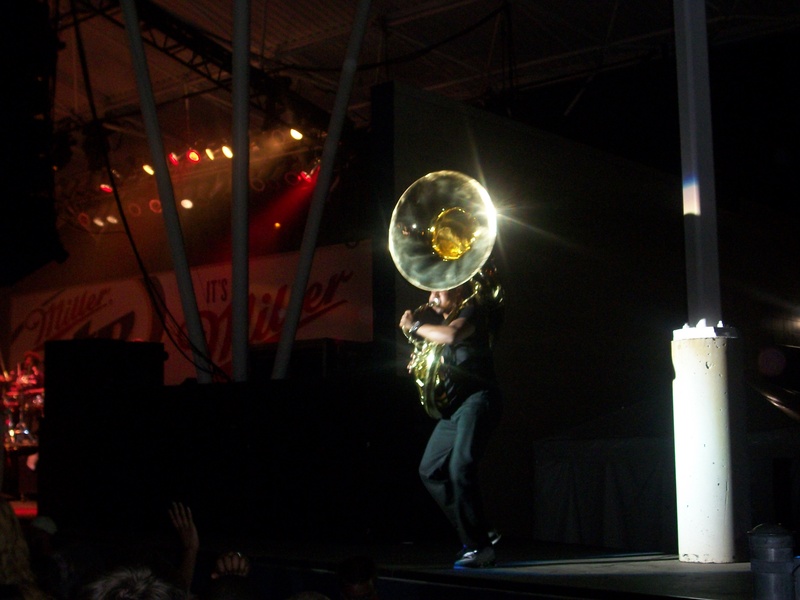 This guy (actual name Damon Bryson) plays the tuba (sousaphone) like it’s nobody’s business. Here he is with my other fave, QuestLove, on percussion. When he’s not playing the tuba, he’s running around stage like a crazy person, pepping up the crowd. To boot, he’s totally adorable. Bad decision #2 is the unpictured McDonald’s meal I ate at midnight on our drive home. I don’t want to talk about it. While we were sleeping last night, our thief friend returned & was spotted by our across-the-street neighbor as he walked through our yard & attempted to open up our next-door-neighbors front door. I get the chills just typing that. We heard nothing, but were told that the police arrived immediately & our entire street was full of cops, sniffing dogs & detectives trying to get this guy. We’ve been told there is a group of 4 guys doing the robbing. Two of them are apparently in police custody and as far as we know, two are still at large. Here’s hoping I can sleep tonight and that these guys get what’s coming to them. Have I mentioned how much I love that guy? How was your weekend? Did it involve any baseball or live music? Our day yesterday was pretty much the quintessential summer day in my opinion. Nothing quite says summer like baseball & an outdoor music festival. Friday was a fun day too, though I wasn’t very camera-ready. We had dinner & drinks on my parents’ patio & visited with my bestie & her son, while they were in town from Phoenix. July 1, 2012 July 2, 2012 trishandthetwinsUncategorizedcerveceros, klement's racing sausages, milwaukee brewers, questlove, summerfest, the roots, tuba gooding jr.